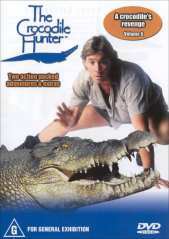 WooooHooooo, its you know who again and this time it is Steve Irwin at his best. That’s right he is back wrestling crocodiles and doing all the crazy things he is renown for. In these two episodes we see Steve first of all going to East Timor to save the lives of a few very abused and neglected crocodiles. In the second chapter Steve is based back in his zoo that he owns and runs with his wife Terri. The zoo they own is the Australia Zoo and it is located in Queensland. In the zoo, Steve and his team of workers set about trying to re-locate several large to small crocodiles around to different parts of the zoo. In the first episode “Crocodiles of the revolution” Steve goes to East Timor where it is shown how bad the war has affected the city of Dilli and its occupants. We are then off to see Steve save the lives of a few very badly treated crocodiles. After enlisting some help from the Australian army, referred to as “Diggers” by the locals. Steve and the Australian army volunteers quickly build some new enclosures with clean water and an area to lie and bask in the sun. The state of these Crocodiles is quite poor. The reason for this is that they have been left abandoned in dirty water or just left in a cage full of water so they never get to use their legs. Steve points out to the viewer that the East Timorese love their crocodiles. He says they even think the island of Timor is one large solidified crocodile and the only problem is that they do not have an education on how to treat these ancient creatures. It is Steve and the crew’s job to move these crocodiles to the enclosures where they are left in peace and out of harms way. Steve and his helpers use their entire repertoire and knowledge to move these animals with as much care as possible. The method of the way they do this is by first lassoing their head and tying their jaws together. Pulling them out of the old enclosure, jumping on them, with the larger crocodiles requiring more weight to keep them secured. The bigger the crocodile the more man power they need. The largest crocodile in this episode needed about 12 men. The reptile is then held tightly and moved quickly to its new home. This is done several times throughout the two episodes and it is a thrill to watch. The way they always get so close to death has a unique appeal especially for the kids. It is also very satisfying to see the crocodiles moved from such a hostile environment they had lived in all their lives to a kind of paradise for crocs. The next Episode “Graham’s Revenge” is situated at Steve’s zoo. What happens in this chapter is mostly the re-location of a lot of crocodiles. The crocodile’s that have grown too large for their old enclosure are put into new bigger homes. Females are put in with males to see if they are compatible. In one instance a female called Cassie is put in with a male called Bluey and they do not get along at all. Bluey is promptly moved to another home and matchmaking is left for another day. Steve’s affiliation and attachment to these creatures is admirable in the way that he loves such hazardous creatures. That includes snakes, bees, ants and beetles. Steve’s boyish enthusiasm and exuberance is very refreshing compared to other Documentary narrators. He is informative as well as educational which is a good thing for the little’uns. Clearly the most dramatic part of “Grahams revenge” is when Steve’s mate Wes was attacked by Graham the Crocodile. There was a lot of rain of “Biblical proportions” and the area that is usually dry land becomes a pond and turns into Croc territory. Steve and Wes were cleaning out debris from the pond when Wes was attacked. Anyway I will not spoil you by elaborating the details as part of the fun is finding this out for yourself. The sound is crystal clear with a small use of music to dramatise what is being said or happening on screen. I would recommend this DVD to many people especially if they have a keen interest in animals. The audience that would get the most out of it would definitely be kids aged 0-13. Overall this title is a lot of fun and is recommended to animal lover’s everywhere.